DENVER, CO / ACCESSWIRE / March 12, 2019 / AmeriCann, Inc. (OTCQB: ACAN), a cannabis company that is developing state-of-the-art cultivation, processing and product manufacturing facilities, announced today that Tim Keogh, CEO, is a featured speaker at the Canna East Compliance Summit in New York City. 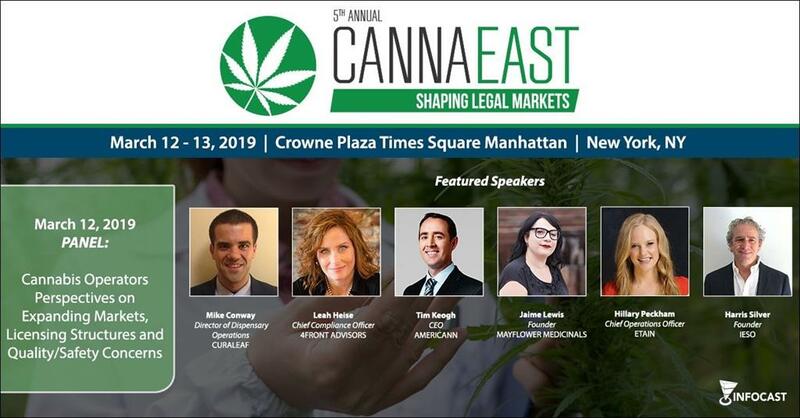 The Canna East Compliance Summit is being held on March 12-13, 2019, at the Crowne Plaza Times Square Manhattan Hotel, 1605 Broadway at 49th Street. Mr. Keogh will be speaking about expanding markets, licensing structures and quality/safety concerns at 4:00pm on Tuesday, March 12. AmeriCann is developing the Massachusetts Cannabis Center (MCC), a state-of-the-art cannabis cultivation and processing development in the midst of the rapidly growing Massachusetts cannabis market. The MCC project is approved for 1 million square feet, which will be developed in phases and is expected to be one of the most technologically advanced facilities in the nation. The first phase of construction at MCC is underway with Building 1, a 30,000 square foot cultivation and processing facility, that will be complete this summer. For a recent video of construction progress at MCC follow this LINK. As the first approved adult-use cannabis market on the Eastern U.S., Massachusetts has the potential to become the epicenter for cannabis innovation and research. Since November 20th 2018, Massachusetts recreational dispensaries have sold more than $41 million worth of cannabis products, including almost $5 million in the most recent week. Annual recreational retail sales are expected to total $1.3 billion – $1.6 billion, according to Marijuana Business Daily. AmeriCann (OTCQB: ACAN) is a cannabis company that is developing cultivation, processing and product manufacturing facilities. AmeriCann uses greenhouse technology which is superior to the current industry standard of growing cannabis in warehouse facilities under artificial lights. According to industry experts, by capturing natural sunlight, greenhouses use 25 percent fewer light bulbs, and utility bills are up to 75 percent less than in typical warehouse cultivation facilities. As such, AmeriCann’s Cannopy System enables cannabis to be produced with a greatly reduced carbon footprint, making the final product less expensive. Additionally, greenhouse construction costs are nearly half of warehouse construction costs. AmeriCann is also designing GMP Certified cannabis extraction and product manufacturing infrastructure. Through a wholly-owned subsidiary, AmeriCann Brands, Inc., the Company intends to secure licenses to produce cannabis infused products including beverages, edibles, topicals, vape cartridges and concentrates. AmeriCann Brands, Inc. plans to operate a Marijuana Product Manufacturing business at Massachusetts Cannabis Center with over 40,000 square feet of state-of-the art extraction and product manufacturing infrastructure. Massachusetts Cannabis Center (MCC), is a one million square foot sustainable greenhouse facility in Freetown, Mass which is being developed by AmeriCann. The first phase of the facility is scheduled to open and be ready for cannabis cultivation, processing, and infused product production in the summer of 2019. Once fully developed, the MCC design calls for a research facility, a training center, corporate offices, a quality-assurance laboratory, and a facility for manufacturing cannabis-infused food, nutraceuticals and consumer packaged cannabis goods. AmeriCann plans to replicate the brands, technology and innovations developed at its MCC project to new markets as a licensed multi-state operator (MSO). This press release contains “forward-looking statements” within the meaning of Section 27A of the Securities Act of 1933, as amended, and Section 21E of the Securities Exchange Act of 1934, as amended (the “Exchange Act”) (which Sections were adopted as part of the Private Securities Litigation Reform Act of 1995). Statements preceded by, followed by or that otherwise include the words “believe,” “anticipate,” “estimate,” “expect,” “intend,” “plan,” “project,” “prospects,” “outlook,” and similar words or expressions, or future or conditional verbs such as “will,” “should,” “would,” “may,” and “could” are generally forward-looking in nature and not historical facts. These forward-looking statements involve known and unknown risks, uncertainties and other factors which may cause the Company’s actual results, performance or achievements to be materially different from any anticipated results, performance or achievements. The Company disclaims any intention to, and undertakes no obligation to, revise any forward-looking statements, whether as a result of new information, a future event, or otherwise. For additional uncertainties that could impact the Company’s forward-looking statements, please see the Company’s Registration Statement on Form S-1, which the Company recently filed with the SEC and which may be viewed at www.sec.gov.